3.1.1.1 – What is a Cable System? 3.1.1.3 – What is DSL? What activities are associated with this chapter? Students should complete Chapter 3, “Assessment” after completing Chapter 3. 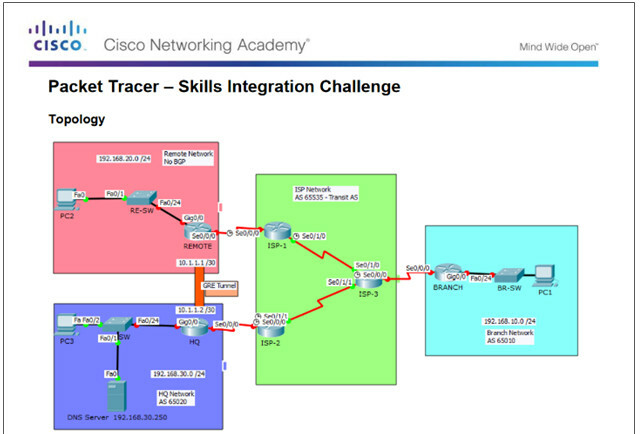 Quizzes, labs, Packet Tracers and other activities can be used to informally assess student progress. 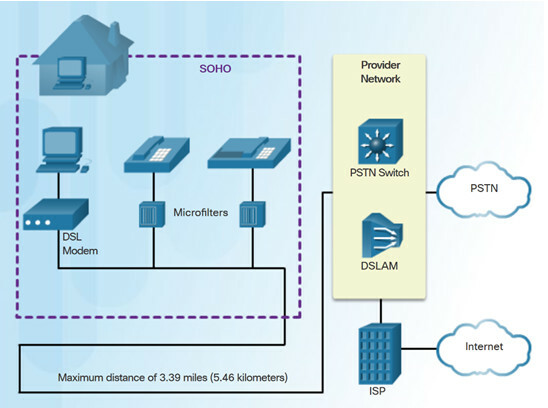 Select broadband remote access technologies to support business requirements. Compare remote access broadband connection options for small to medium-sized businesses. 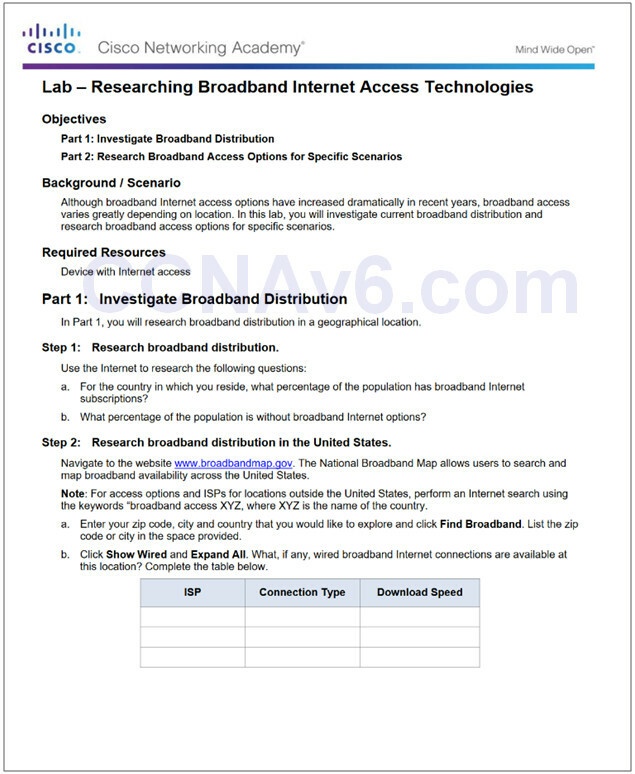 Select an appropriate broadband connection for a given network requirement. Implement a basic PPPoE connection on a client router. Explain how VPNs secure site-to-site and remote access connectivity. Describe benefits of VPN technology. Describe site-to-site and remote access VPNs. Explain the purpose and benefits of GRE tunnels. 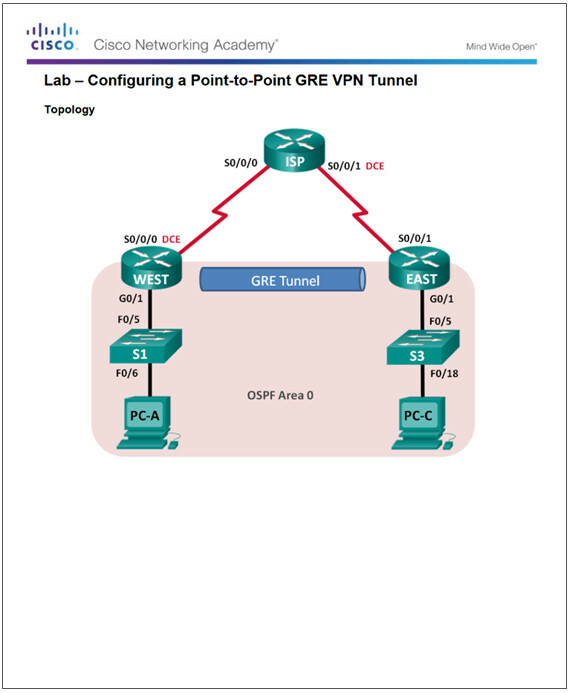 Troubleshoot a site-to-site GRE tunnel. 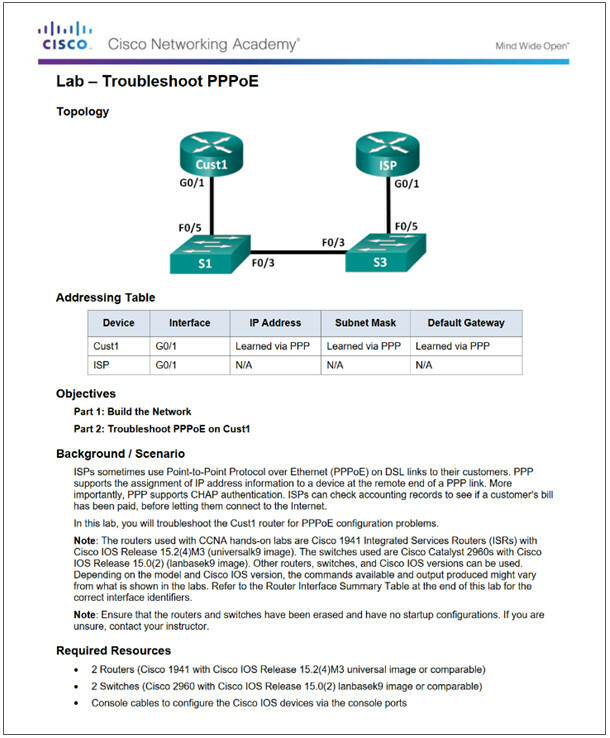 Implement eBGP in a single-homed remote access network. 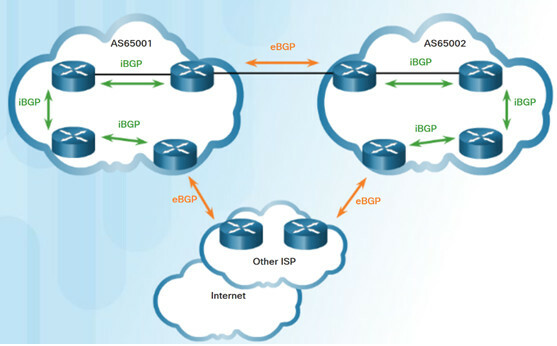 Configure an eBGP branch connection. 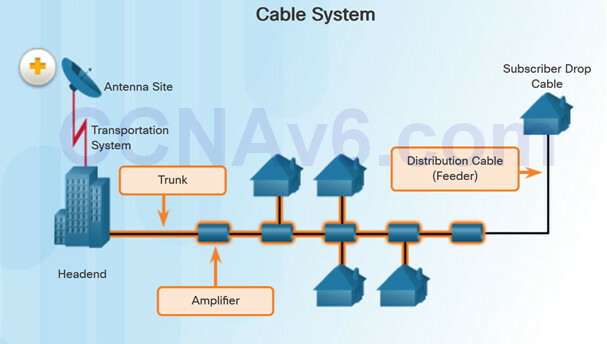 Cable system uses a coaxial cable that carries radio frequency (RF) signals across the network. 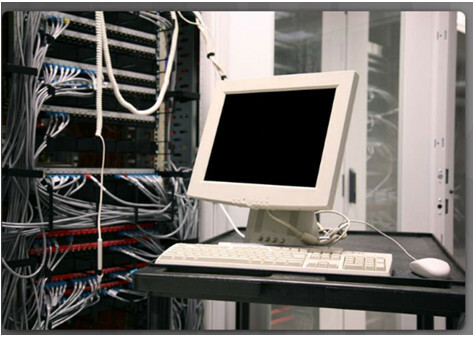 Cable systems provide high-speed Internet access, digital cable television, and residential telephone service. Use hybrid fiber-coaxial (HFC) networks to enable high-speed transmission of data. Cable Modem Termination System (CMTS) at the headend of the cable operator. The headend is a router with databases for providing Internet services to cable subscribers. Cable Modem (CM) on the subscriber end. Digital Subscriber Line (DSL) is a means of providing high-speed connections over installed copper wires. 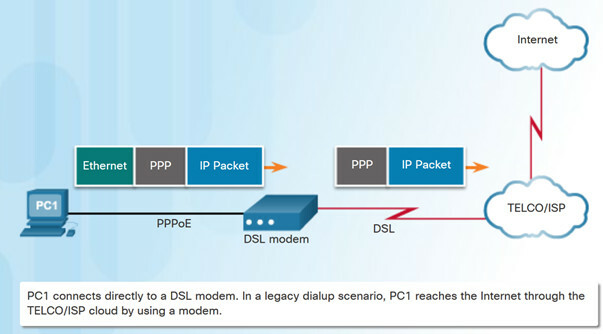 Asymmetric DSL (ADSL) provides higher downstream bandwidth to the user than upload bandwidth. Symmetric DSL (SDSL) provides the same capacity in both directions. For satisfactory ADSL service, the local loop length must be less than 3.39 miles (5.46 km). The figure shows a representation of bandwidth space allocation on a copper wire for ADSL. POTS (Plain Old Telephone System) identifies the frequency range used by the voice-grade telephone service. 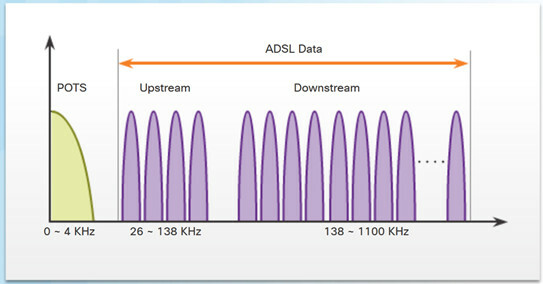 The area labeled ADSL represents the frequency space used by the upstream and downstream DSL signals. The DSL connection is set up between the customer premises equipment (CPE) and the DSL access multiplexer (DSLAM) device located at the Central Office (CO). Transceiver – Usually a modem in a router which connects the computer of the teleworker to the DSL. DSLAM – Located at the CO of the carrier, it combines individual DSL connections from users into one high-capacity link to an ISP. Advantage of DSL over cable technology is that DSL is not a shared medium. Each user has a separate direct connection to the DSLAM. 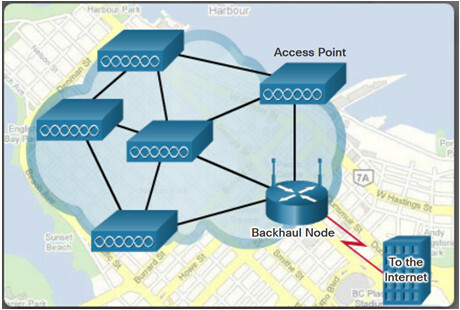 Municipal Wi-Fi – Most municipal wireless networks use a mesh of interconnected access points as shown in figure. Cellular/mobile – Mobile phones use radio waves to communicate through nearby cell towers. Cellular speeds continue to increase. LTE Category 10 supports up to 450 Mb/s download and 100 Mb/s upload. Satellite Internet – Used in locations where land-based Internet access is not available. Primary installation requirement is for the antenna to have a clear view toward the equator. Note: WiMAX has largely been replaced by LTE for mobile access, and cable or DSL for fixed access. Cable – Bandwidth shared by many users, slow data rates during high-usage hours. DSL – Limited bandwidth that is distance sensitive (in relation to the ISP’s central office). 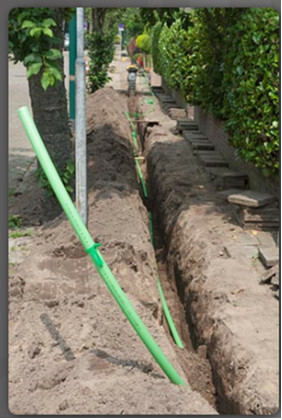 Fiber-to-the-Home – Requires fiber installation directly to the home. Cellular/Mobile – Coverage is often an issue. Wi-Fi Mesh – Most municipalities do not have a mesh network deployed. PPP can be used on all serial links including those links created with dial-up analog and ISDN modems. ISPs often use PPP as the data link protocol over broadband connections. ISPs can use PPP to assign each customer one public IPv4 address. Ethernet links do not natively support PPP. PPP over Ethernet (PPPoE) provides a solution to this problem. PPPoE creates a PPP tunnel over an Ethernet connection. This allows PPP frames to be sent across the Ethernet cable to the ISP from the customer’s router. To create the PPP tunnel a dialer interface is configured. The PPP CHAP is then configured. Use ppp chap hostname name and ppp chap password password. 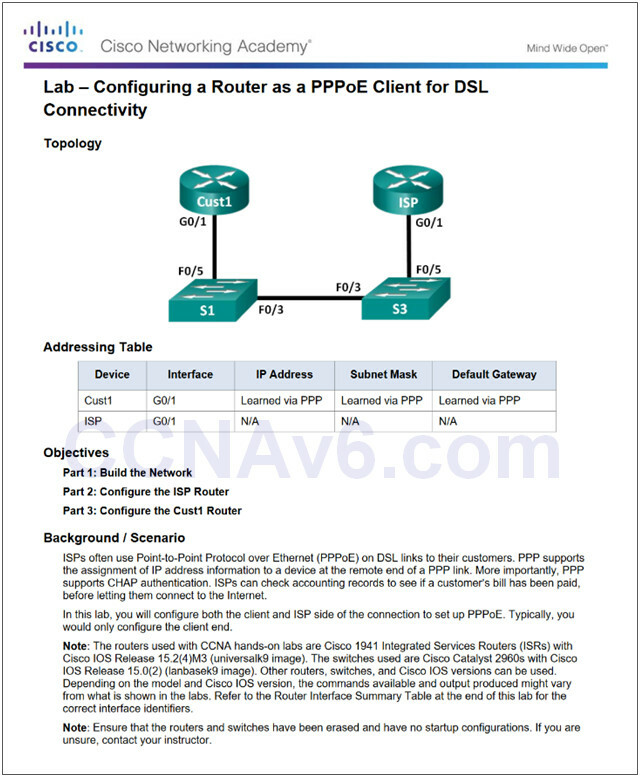 The physical Ethernet interface connected to the DSL modem is enabled with the command pppoe enable interface configuration command. 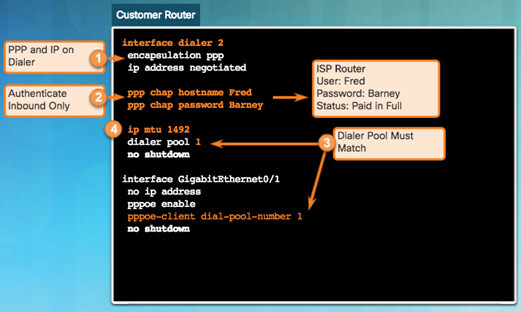 Dialer interface is linked to the Ethernet interface with the dialer pool and pppoe-client interface configuration commands. The MTU should be set to 1492 to accommodate PPPoE headers. show ip interface brief – verify the IPv4 address automatically assigned. show interface dialer – verifies the MTU and PPP encapsulation. show pppoe session – displays information about currently active PPPoE sessions. Use the debug ppp negotiation command to verify PPP negotiation. No response from the remote device. Link Control Protocol (LCP) not open. IP Control Protocol (IPCP) failure. Verify that the CHAP username and password are correct using debug ppp negotiation command. PPPoE supports an MTU of only 1492 bytes in order to accommodate the additional 8-byte PPPoE header. Use show running-config command to verify PPPoE MTU. 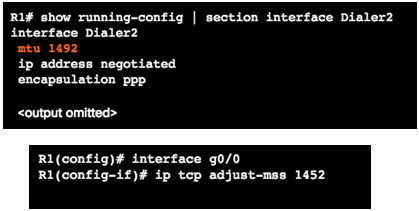 The ip tcp adjust-mss max-segment-size interface command prevents TCP sessions from being dropped by adjusting the MSS value during the TCP 3-way handshake. A VPN is a private network created via tunneling over a public network, usually the Internet. A secure implementation of VPN with encryption, such as IPsec VPNs, is what is usually meant by virtual private networking. To implement VPNs, a VPN gateway is necessary – could be a router, a firewall, or a Cisco Adaptive Security Appliance (ASA). Cost savings – VPNs enable organizations to use cost-effective, high-bandwidth technologies, such as DSL to connect remote offices and remote users to the main site. Scalability – Organizations are able to add large amounts of capacity without adding significant infrastructure. Compatibility with broadband technology – Allow mobile workers and telecommuters to take advantage of high-speed, broadband connectivity. Security – VPNs can use advanced encryption and authentication protocols. 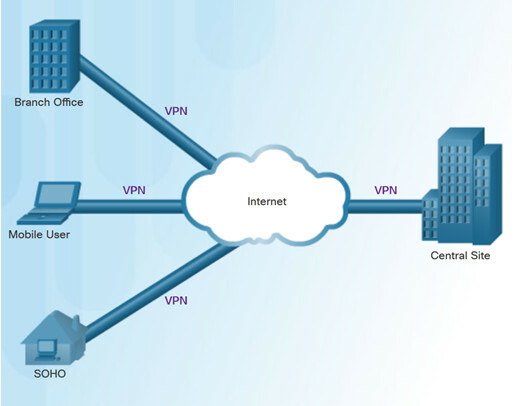 Site-to-site VPNs connect entire networks to each other, for example, connecting a branch office network to a company headquarters network. In a site-to-site VPN, end hosts send and receive normal TCP/IP traffic through a VPN “gateway”. The VPN gateway is responsible for encapsulating and encrypting outbound traffic. A remote-access VPN supports the needs of telecommuters, mobile users, and extranet traffic. Allows for dynamically changing information, and can be enabled and disabled. Used to connect individual hosts that must access their company network securely over the Internet. VPN client software may need to be installed on the mobile user’s end device. 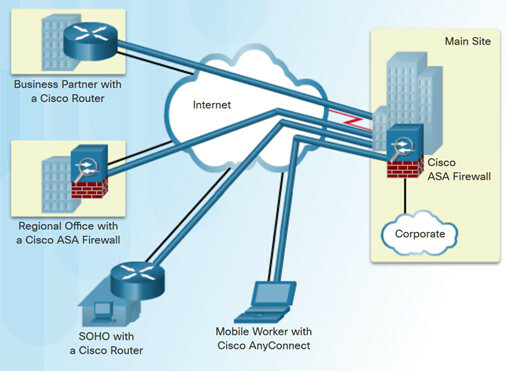 Dynamic Multipoint VPN (DMVPN) is a Cisco software solution for building multiple VPNs. Next Hop Resolution Protocol (NHRP) – NHRP creates a distributed mapping database of public IP addresses for all tunnel spokes. 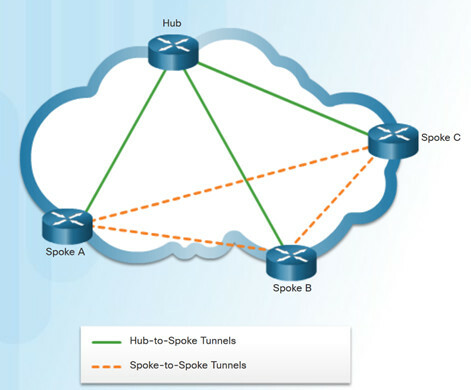 Multipoint Generic Routing Encapsulation (mGRE) tunnels – An mGRE tunnel interface allows a single GRE interface to support multiple IPsec tunnels. IP Security (IPsec) encryption – provides secure transport of private information over public networks. 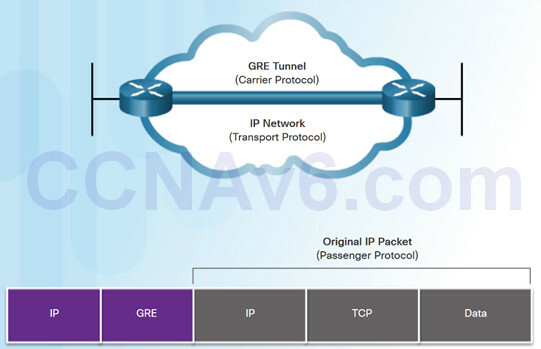 Generic Routing Encapsulation (GRE) is a non-secure, site-to-site VPN tunneling protocol. An encapsulated protocol – or passenger protocol, such as IPv4, IPv6. 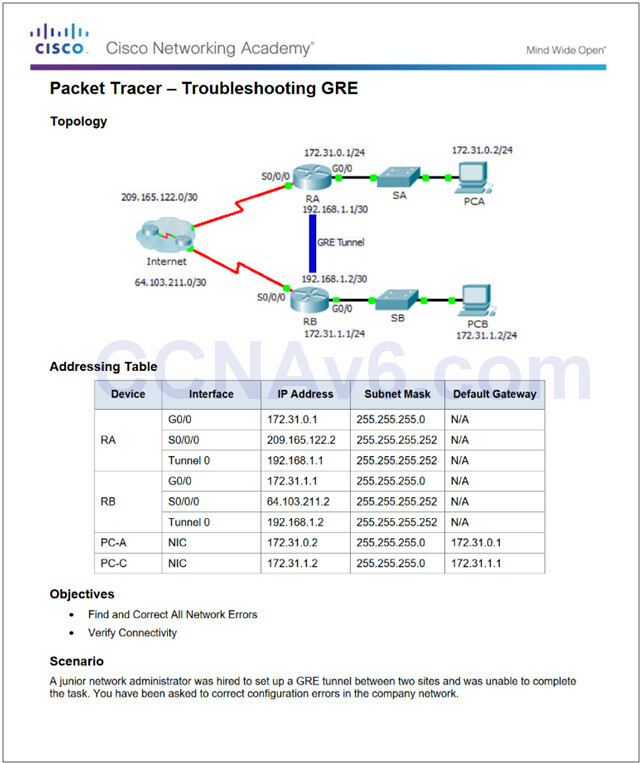 An encapsulation protocol – or carrier protocol, such as GRE. A transport delivery protocol, such as IP. GRE is defined as an IETF standard (RFC 2784). In the outer IP header, 47 is used in the protocol field. 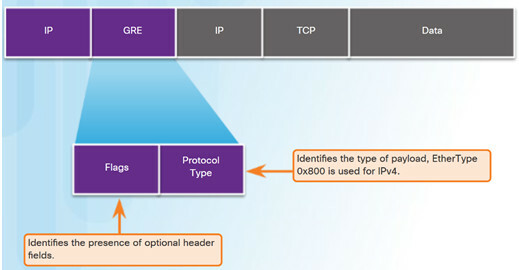 GRE encapsulation uses a protocol type field in the GRE header to support the encapsulation of any OSI Layer 3 protocol. GRE does not include any strong security mechanisms. GRE header, together with the tunneling IP header, creates at least 24 bytes of additional overhead for tunneled packets. Step 1. Create a tunnel interface using the interface tunnel number command. Step3. Specify the tunnel source IP address. Step 4. Specify the tunnel destination IP address. Step 5. 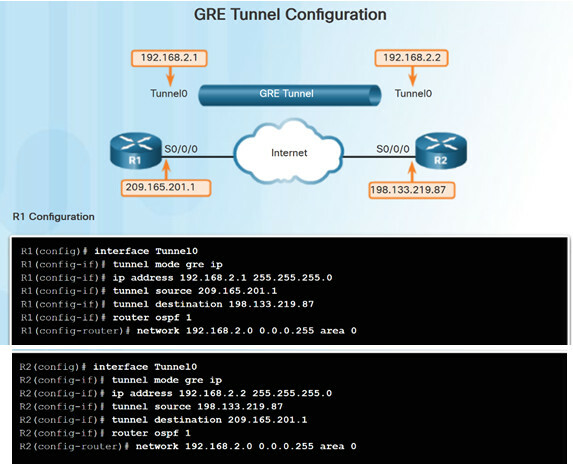 (Optional) Specify GRE tunnel mode as the tunnel interface mode. Note: The tunnel source and tunnel destination commands reference the IP addresses of the preconfigured physical interfaces. Use the show ip interface brief command to verify that the tunnel interface is up. Use the show interface tunnel command to verify the state of the tunnel. 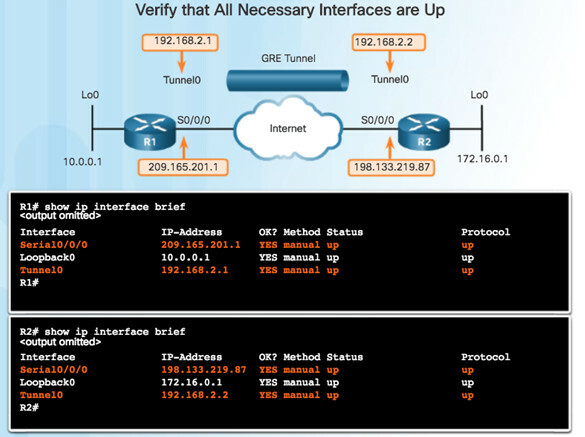 Use the show ip ospf neighbor command to verify that an OSPF adjacency has been established over the tunnel interface. 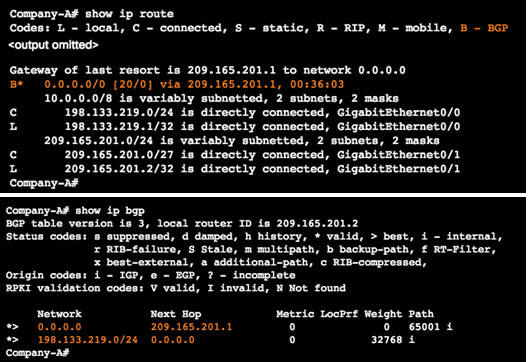 The tunnel interface IP addresses are not on the same network or the subnet masks do not match. Use the show ip interface brief command. The interfaces for the tunnel source and/or destination are not configured with the correct IP address or are down. Use the show ip interface brief command. Static or dynamic routing is not properly configured. 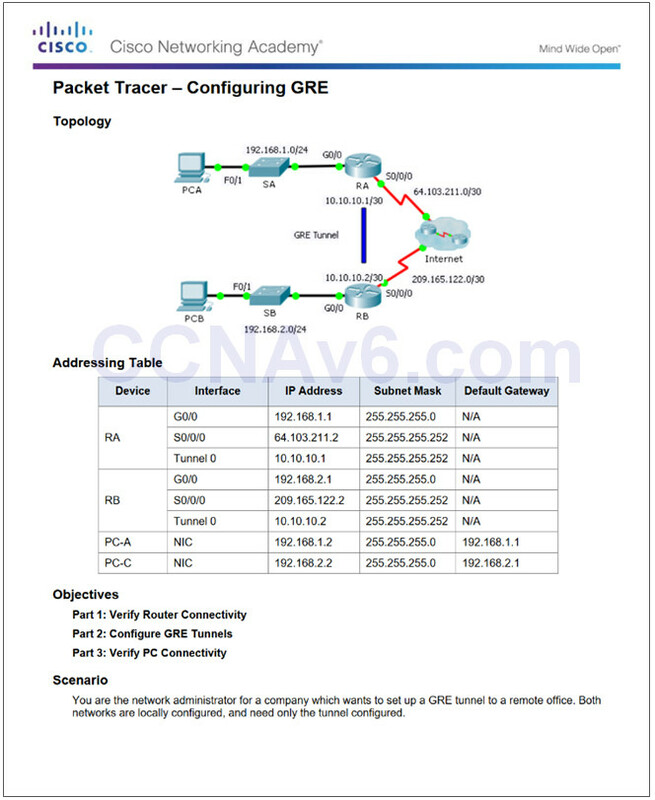 Use show ip route or show ip ospf neighbor. IGPs are used to exchange routing information within a company network or an autonomous system (AS). An Exterior Gateway Protocol (EGP) is used for the exchange of routing information between autonomous systems, such as ISPs. Border Gateway Protocol (BGP) is an Exterior Gateway Protocol (EGP). Every AS is assigned a unique 16-bit or 32-bit AS number which uniquely identifies it on the Internet. External BGP (eBGP) – External BGP is the routing protocol used between routers in different autonomous systems. 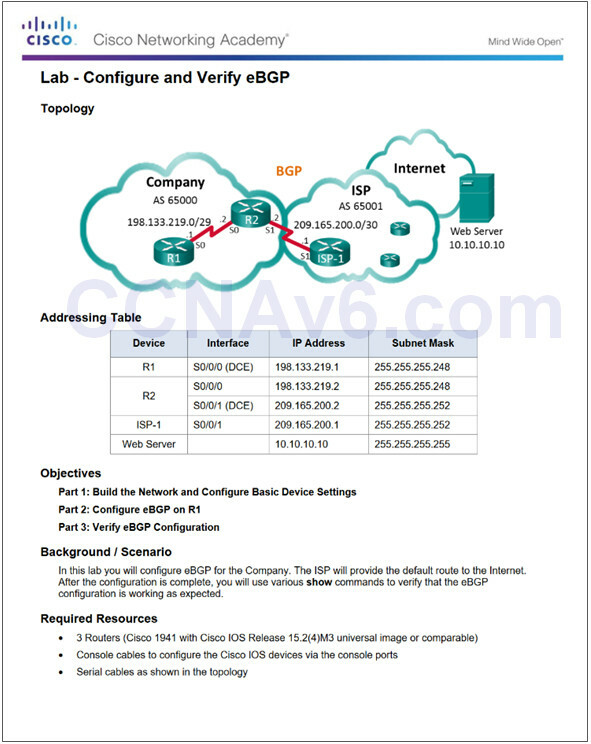 Internal BGP (iBGP) – Internal BGP is the routing protocol used between routers in the same AS. 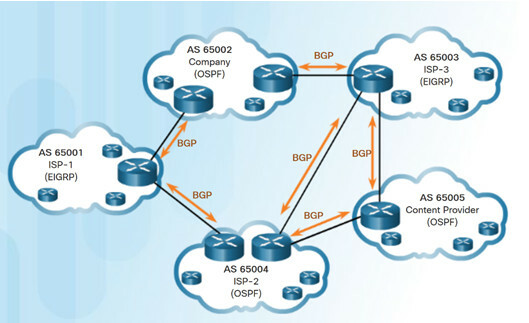 BGP is used when an AS has connections to multiple autonomous systems. This is known as multi-homed. A misconfiguration of a BGP router could have negative effects throughout the Internet. There is a single connection to the Internet or another AS. Known as single-homed. When there is a limited understanding of BGP. Note: Although it is recommended only in unusual situations, for the purposes of this course, you will configure single-homed BGP. Advertise network(s) originating from this AS. 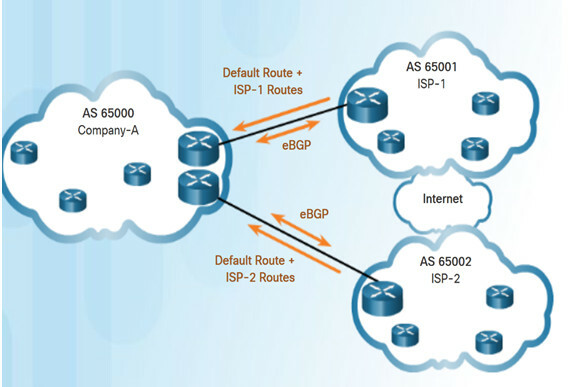 The router bgp as–number global configuration command enables BGP and identifies the AS number. 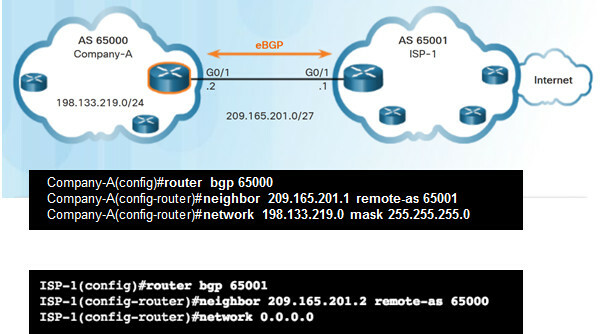 The neighbor ip-address remote-as as-number router configuration command identifies the BGP peer and its AS number. The network network-address [mask network-mask] router configuration command enters the network-address into the local BGP table. Note: The network-address used in the network command does not have to be a directly connected network.